The CH7308B is a display controller device, which accepts digital graphics input signals, upscales, encodes, and transmits data through an LVDS transmitter to a LCD panel. This device accepts one channel of RGB data over three pairs of serial data ports. 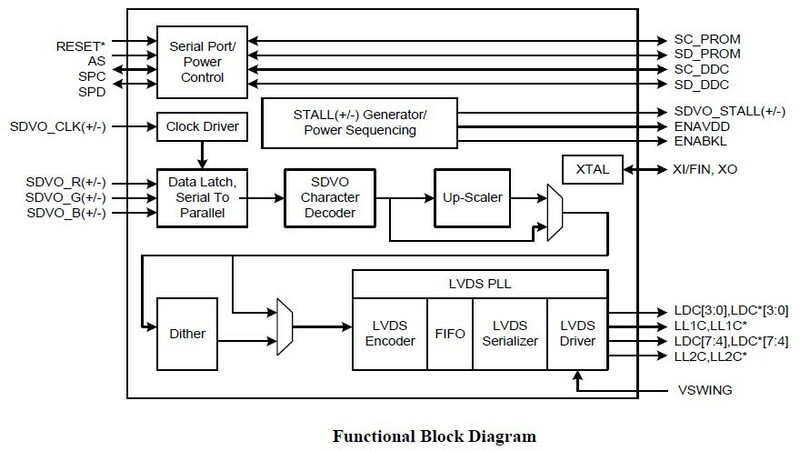 The LVDS Transmitter includes a low jitter PLL to generate a high frequency serialized clock and all circuitry required to upscale, encode, serialize and transmit data. The CH7308B supports a maximum pixel rate of 165MP/s. The LVDS transmitter includes a panel fitting up-scaler and a programmable dither function to support 18-bit LCD panels. Data is encoded into commonly used formats, including those specified in the OpenLDI and SPWG specifications. Serialized data is outputted on three to eight differential channels.